I am porting an existing application to C# and want to improve performance wherever possible. Many existing loop counters and array references are defined as System.UInt32, instead of the Int32 I would have used. Is there any significant performance difference for using UInt32 vs Int32? I don't think there are any performance considerations, other than possible difference between signed and unsigned arithmetic at the processor level but at that point I think the differences are moot. The bigger difference is in the CLS compliance as the unsigned types are not CLS compliant as not all languages support them. The short answer is "No. Any performance impact will be negligible". The correct answer is "It depends." A better question is, "Should I use uint when I'm certain I don't need a sign?" The reason you cannot give a definitive "yes" or "no" with regards to performance is because the target platform will ultimately determine performance. That is, the performance is dictated by whatever processor is going to be executing the code, and the instructions available. Your .NET code compiles down to Intermediate Language (IL or Bytecode). These instructions are then compiled to the target platform by the Just-In-Time (JIT) compiler as part of the Common Language Runtime (CLR). You can't control or predict what code will be generated for every user. So knowing that the hardware is the final arbiter of performance, the question becomes, "How different is the code .NET generates for a signed versus unsigned integer?" and "Does the difference impact my application and my target platforms?" The best way to answer these questions is to run a test. These results are nearly identical, but to get a definitive answer, we really need to look at the bytecode generated for the program. 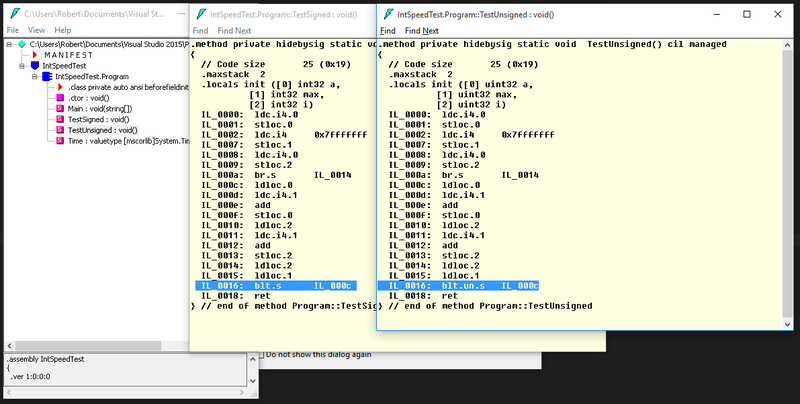 We can use ILDASM as part of the .NET SDK to inspect the code in the assembly generated by the compiler. blt.un.s : Branch to target if less than (unsigned or unordered), short form. blt.s : Branch to target if less than, short form. Being such a common instruction, it's safe to assume that most modern high-power processors will have hardware instructions for both operations and they'll very likely execute in the same number of cycles, but this is not guaranteed. A low-power processor may have fewer instructions and not have a branch for unsigned int. In this case, the JIT compiler may have to emit multiple hardware instructions (A conversion first, then a branch, for instance) to execute the blt.un.s IL instruction. Even if this is the case, these additional instructions would be basic and probably wouldn't impact the performance significantly. So in terms of performance, the long answer is "It is unlikely that there will be a performance difference at all between using a signed or an unsigned integer. If there is a difference, it is likely to be negligible." So then if the performance is identical, the next logical question is, "Should I use an unsigned value when I'm certain I don't need a sign?" There are two things to consider here: first, unsigned integers are NOT CLS-compliant, meaning that you may run into issues if you're exposing an unsigned integer as part of an API that another program will consume (such as if you're distributing a reusable library). Second, most operations in .NET, including the method signatures exposed by the BCL (for the reason above), use a signed integer. So if you plan on actually using your unsigned integer, you'll likely find yourself casting it quite a bit. This is going to have a very small performance hit and will make your code a little messier. In the end, it's probably not worth it. TLDR; back in my C++ days, I'd say "Use whatever is most appropriate and let the compiler sort the rest out." C# is not quite as cut-and-dry, so I would say this for .NET: There's really no performance difference between a signed and unsigned integer on x86/x64, but most operations require a signed integer, so unless you really NEED to restrict the values to positive ONLY or you really NEED the extra range that the sign bit eats, stick with a signed integer. Your code will be cleaner in the end. There is no difference, performance wise. Simple integer calculations are well known and modern cpu's are highly optimized to perform them quickly. These types of optimizations are rarely worth the effort. Use the data type that is most appropriate for the task and leave it at that. If this thing so much as touches a database you could probably find a dozen tweaks in the DB design, query syntax or indexing strategy that would offset a code optimization in C# by a few hundred orders of magnitude. Its going to allocate the same amount of memory either way (although the one can store a larger value, as its not saving space for the sign). So I doubt you'll see a 'performance' difference, unless you use large values / negative values that will cause one option or the other to explode. this isn't really to do with performance rather requirements for the loop counter. The unsigned int may be there for a reason. 6034 Use Silverlight Isolated Storage To Keep Authentication Token? 1335 C# GetHashCode with two Int16, also returns only up to Int32? 4296 C# GetHashCode with two Int16, also returns only up to Int32? How fast is AppDomain creation?